Cedarville senior Maggie Coe (30) drives in on Greeneview senior Hannah Ferrell for an easy layup early in the first quarter in their final regular season game, Feb. 9 at Cedarville High School. Greenview senior Kenzie Harding attempts a three-point shot in Saturday’s Ohio Heritage Conference game at Cedarville High. Harding and teammate Caitlin Sweat led the Rams with 12 points. CEDARVILLE — Sometimes, a single player can ruin an opposing team’s entire game plan. 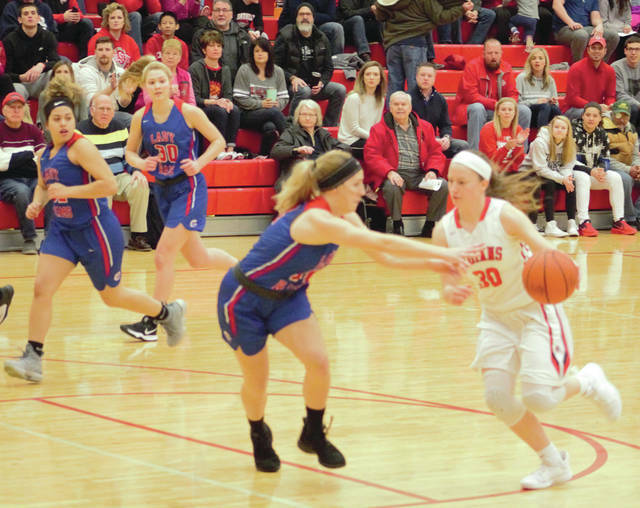 In their final regular season game, the Cedarville Indians defeated this year’s Ohio Heritage Conference champions, the Greenview Rams, by a score of 61-44, thanks in large part to senior Maggie Coe. Coe led the Indians (16-6, 11-5 in the OHC South) with 30 points and five assists. The Rams (16-5, 13-3 OHC South) tried to take away Coe and force the Indians to score in different ways, but they simply couldn’t stop her. Hoelle said the team simply did not execute what they wanted to accomplish, but added that this game was a great experience to get ready for the crazy playoff environment. “We’ll get better from this and refocus Monday and Tuesday and hopefully be ready for our game on Wednesday,” Hoelle said. 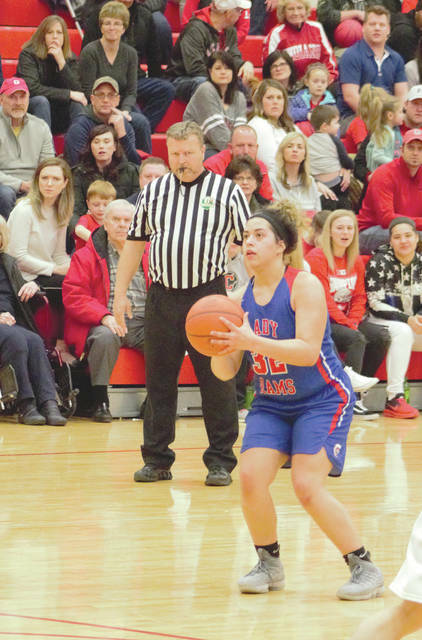 The sixth seeded Rams will play against seventh seeded Arcanum at 6 p.m., Wednesday, Feb. 13 at Covington High School for their first-round game in the Division III sectional tournament.. The Indians hope to build on their momentum from the win and carry it over to the postseason. The second seeded Indians will begin Division IV sectional tourney play against No. 9-seed Miami Valley Christian at 5:30 p.m., Wednesday Feb 13 at Monroe High. https://www.xeniagazette.com/wp-content/uploads/sites/32/2019/02/web1_MaggieCoeDrive_PS.jpgCedarville senior Maggie Coe (30) drives in on Greeneview senior Hannah Ferrell for an easy layup early in the first quarter in their final regular season game, Feb. 9 at Cedarville High School. https://www.xeniagazette.com/wp-content/uploads/sites/32/2019/02/web1_KenzieHarding_PS.jpgGreenview senior Kenzie Harding attempts a three-point shot in Saturday’s Ohio Heritage Conference game at Cedarville High. Harding and teammate Caitlin Sweat led the Rams with 12 points.